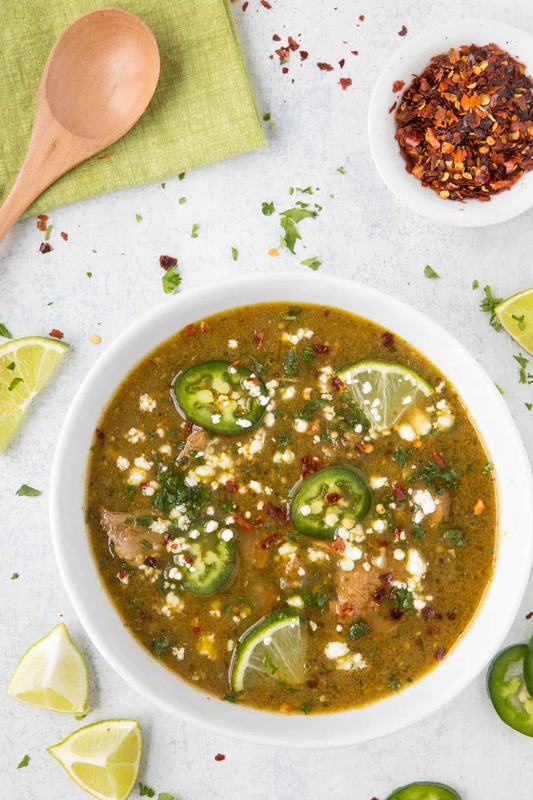 This chili verde recipe is made with tender pork shoulder that has been seasoned and seared, then cooked low and slow in a rich verde sauce made from roasted tomatillos, poblanos and jalapeno peppers. It’s “Chili Madness” in the Chili Pepper Madness household lately. I’ve been going gangbusters making chili because the weather has turned here and the only thing I like about the cold is warm soups and chili. A good chili can warm up those chilly bones, and to be honest, not much else can hit the spot like a good bowl of chili. Right? Chili! I love the stuff! Most people think of a big bowl of RED when it comes to chili – like my Chili Colorado Recipe – but a really good chili can also be GREEN. Like this one. We’re talking Chili Verde, my friends! And it’s some pretty dang GREAT stuff! 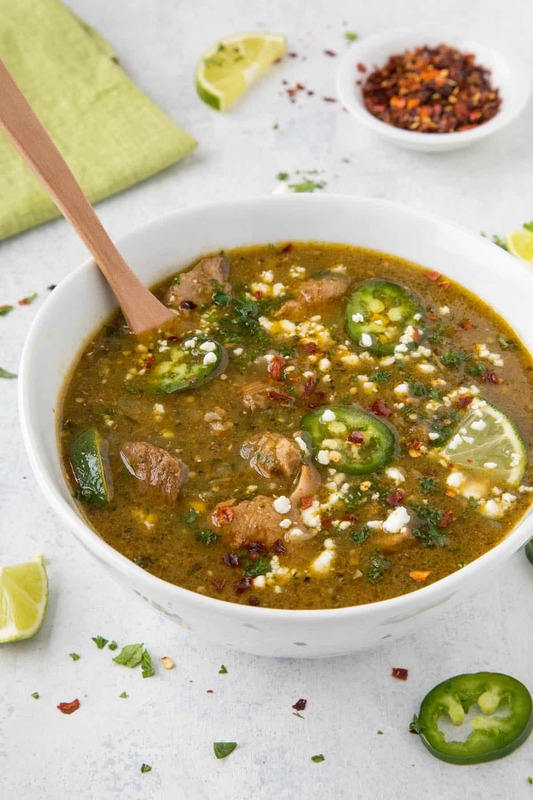 Chili verde is a green chili made with tender pork shoulder that has been seasoned and seared, then cooked low and slow in a rich verde sauce. 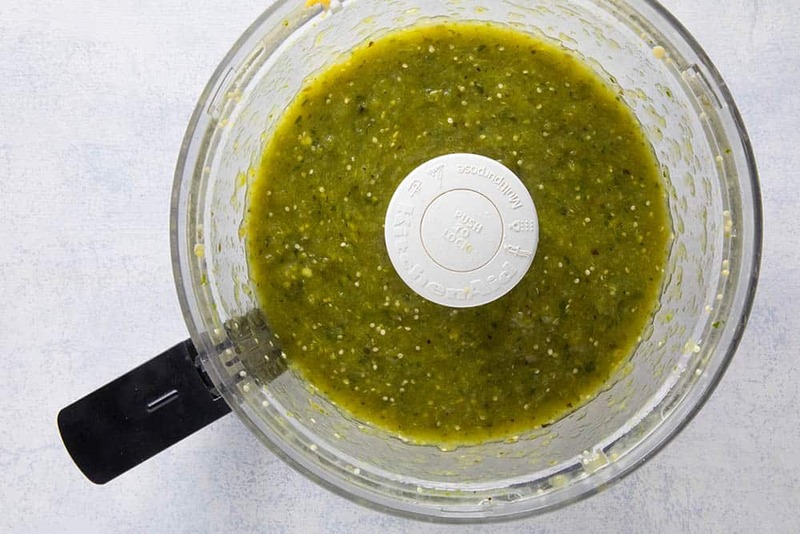 The verde sauce is KEY here, made from roasted tomatillos, poblanos and jalapeno peppers. 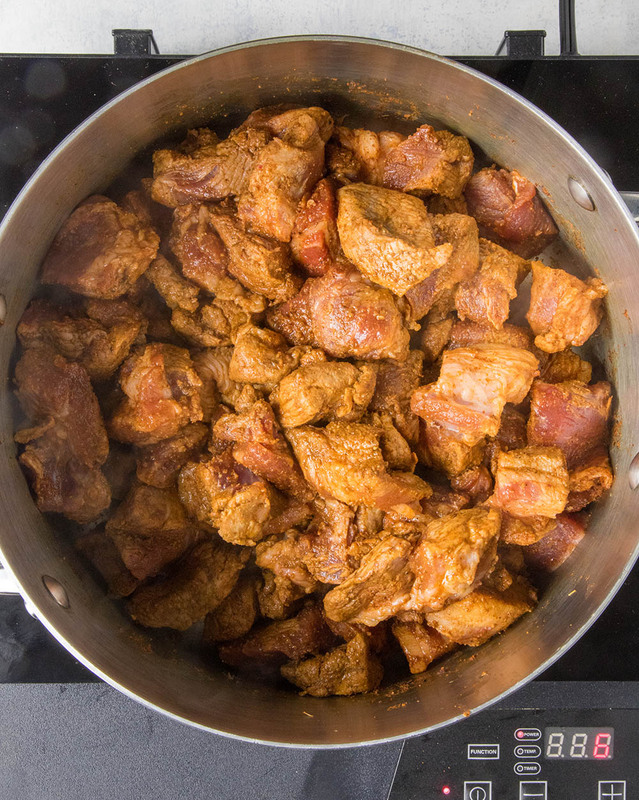 Pork is traditional with chili verde, though you can make it with other meats. Chicken is particularly good. 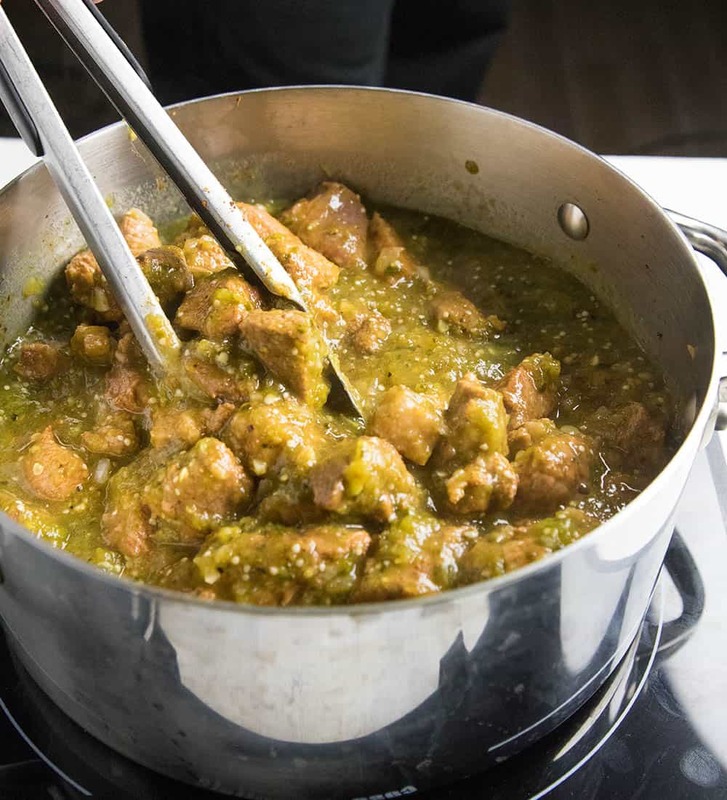 Some people have come to call Chili Verde “Colorado Green Chili”, because the cooking method is somewhat similar to Chili Colorado, with the meat simmering away slowly in sauce until it becomes super tender and flavorful. It’s funny, though, because “Chili Colorado” literally translates to “Chili Colored Red”, so what they’re really saying is “Red Green Chili”. Fun fact for you. Chili Verde is definitely one of my favorites, and I think it will be one of your favorites as well. Let’s talk about how we make it! Authentic Chili Verde coming your way. First, make your verde sauce. Preheat your oven to broil. 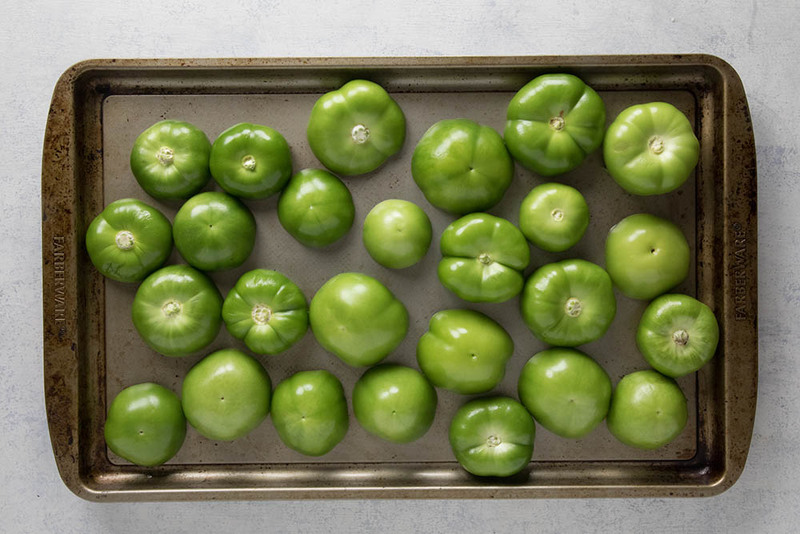 Slice the peeled and rinsed tomatillos in half through the horizontal center (not up and down) and arrange on a lightly oiled baking dish with the skin sides up. Place the peppers on a separate lightly oiled baking sheet skin sides up. Bake the peppers and tomatillos about 12-15 minutes until skin side is blistering on both the tomatillos and peppers. Rotate the baking sheets if needed. You may need up to 20 minutes, depending on your proximity to the heat element. Remove from heat and cool slightly. They will look like this. Peel off the pepper skins and discard them. You can peel off the tomatillos skins if you’d like, but I leave them on. 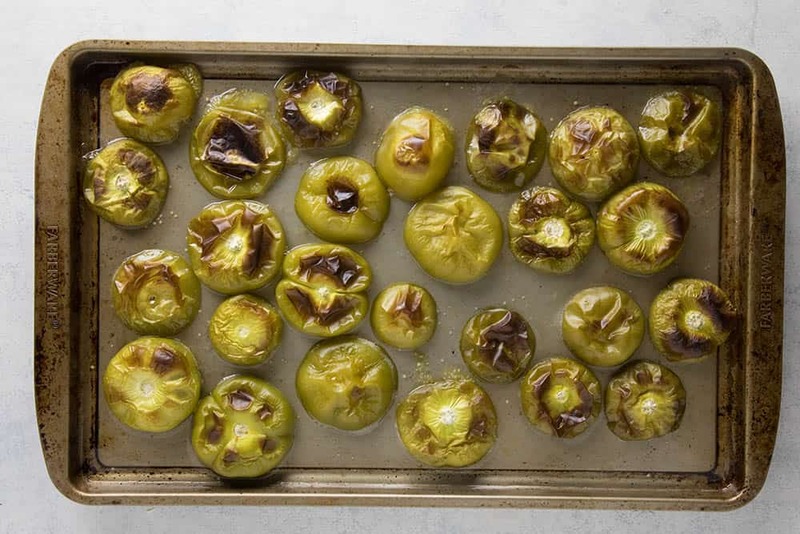 Learn more about How to Roast Tomatillos and How to Roast Chili Peppers. Add the tomatillos and peppers to a food processor. Process until smooth. Set aside for now. For making the chili verde, heat a large pot to medium heat and add a bit of olive oil. Season the pork shoulder with ancho powder, cumin, salt and pepper, then sear the cubes a minute or 2 on each side, until each side is nicely browned, stirring here and there. Add the onions and stir. Cook them down about 5 minutes to soften. Stir in the garlic and Mexican oregano and cook another minute. Add the reserved verde sauce along with ½ cup chicken stock, or up to a cup if you’d like a thinner chili verde. Bring to a quick boil, then reduce the heat and cover. Simmer for 2 hours (you may need longer), until the pork is fork tender. Remove the chili verde from the heat and stir in the chopped cilantro and juice from 1 lime. Serve it up in bowls and top with your fixings – Extra limes, sliced jalapeno peppers, fresh chopped cilantro, crumbly white cheese, spicy chili flakes. Whatever you like! It’s so good, isn’t it? I love this stuff! A lot of chili verde recipes forego any additional seasonings and let the dish gain its flavor entirely from the pork and the verde sauce, which truly is delicious. However, I like to add in a bit of cumin and particularly ancho powder for additional flavor. You know me, I LOVE big flavor, and these seasonings bring this dish to the TOP for me. Feel free to incorporate other seasonings to your own preference. You can serve up your chili verde in a bowl on its own and you’ll love it. Or, serve it over a bit of rice to help absorb all that verde sauce. Try serving it with tortillas so you can enjoy it as tacos. It’s also great served over chips as sort of a chili verde nacho bowl. Make your verde sauce first. Preheat your oven to broil. Remove from heat and cool slightly. Peel off the pepper skins and discard them. You can peel off the tomatillos skins if you’d like, but I leave them on. Heat Factor: Mild-Medium. You’ll get some spicy heat from the jalapenos, but not a lot. Try adding in a few serrano peppers for some added heat, or bring in spicier chili powders and flakes. Hot sauce is a nice addition as well. Absolutely great. I live more than forty miles from a halfway decent source of chiles so I stock up when I visit there. I was down to my last three poblanos so I used them in this recipe. It turned out perfect. On my next chile buying trip I will make sure to get extra poblanos so I can make this one again (and again). I live in a heavily wooded area and don’t get enough sun to do a good job at raising chiles or tomatoes. I can raise a few on my deck but not enough to make much of a dent in my needs. Is there any way to extend the “shelf life” of purchased fresh chiles? Excellent, thanks. Check out my Preserving Chili Peppers section of the site for ideas to preserve them. Freezing would probably be your best method. You can roast then freeze them, too. You might also purchase dried poblano peppers (ancho peppers), which last a very long time and have HUGE flavor. Good luck! 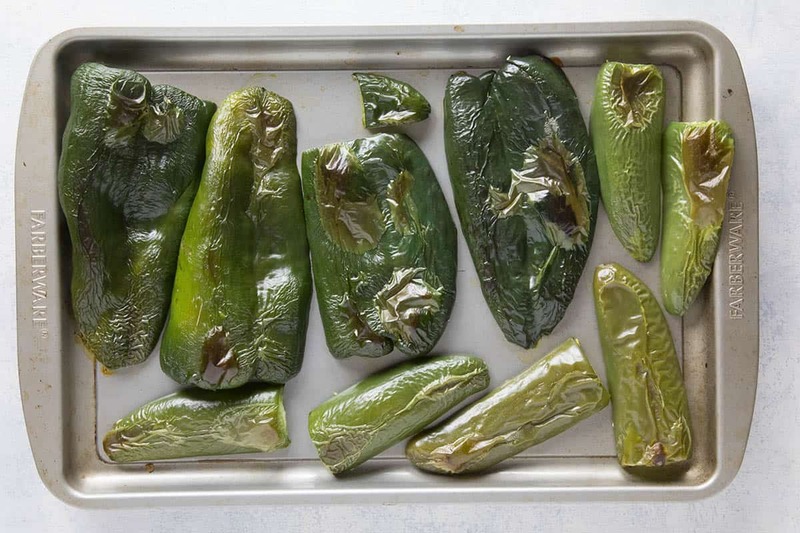 Do you take out the seeds of the poblano and jalapeños? Sharon, I seeded the poblanos, but not the jalapeno peppers. However, you can deseed them if you’d like. Loved it, however it was a bit too spicy for me family. I only used 2 jalapeños (no seeds). Is there a way to tone it down? Thanks, Yvonne. To tame the heat, you can add a dairy, such as milk or sour cream. 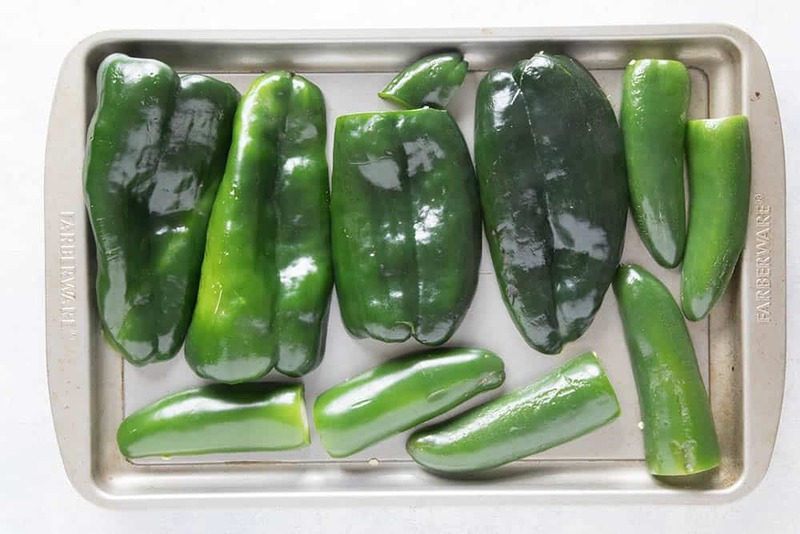 Or, make another batch without any jalapeno peppers and combine them to dilute the overall heat. I hope this helps! 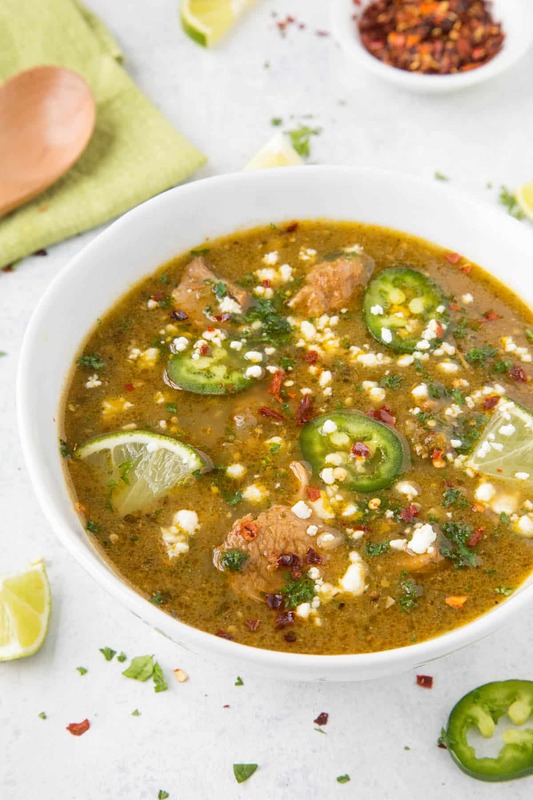 Michael, my mouth is salivating with this recipe, I lovee, lovvvvve Chili Verde and honestly it’s the best with pork and pork shoulder, even better. Excellent recipe! Yes! Soooo good. I love it, too. I love when I learn something and get a great recipe! I had no idea that Colorado meant colored Red! That was fascinating! Anyway, I can’t wait to try this! Thanks! perfect thing to kill my spice love Mike! Way to go! Perfect recipe for my Indian, spice loving friends. Amazingly described recipe, way to go! Loving the sauce, although I would skip the chilli as I’m veggie. You can make this without the pork as a vegetarian version. You can add in extra sliced roasted poblano peppers to add more substance to it. I think that would be GREAT. Yum, I haven’t tried a green chili before only with the red. Will have to give this a try. I do believe you’ll love it! This recipe looks so delicious! I love the spiciness of the peppers and chili, and the brightness of the lime. Can’t wait to make this! It’s easy to adjust the spices, too, which I love. Extra spicy for me, please! This looks like the perfect recipe for my spicey food loving friends! I think so, too! Thanks, Krissy! Hey Mike! One more time, a great recipe, realy tasty, I loved the lime touch. I just used bacon instead of shoulder. Excellent, Jeremie! Sounds pretty awesome with bacon. Glad you enjoyed it.